The Salzburg Cathedral. Photo: LaLa Betty. 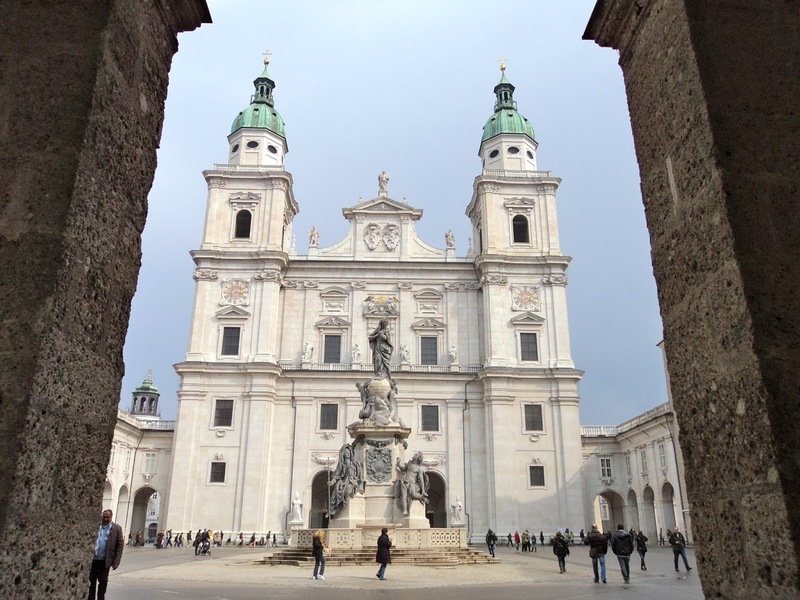 September 25th marked the anniversary of the consecration of the first cathedral on the site of the Salzburg Cathedral (Salzburger Dom) in the year 774. Breaking ground in 1614, the current structure was completed in 1628. Since the founding of the Salzburg Cantorey in 1393, this historical site has been home to Salzburg's sacred music tradition for over 600 years. As a preservationist, it's a privilege for me to visit any historical location or venue, but I feel especially fortunate to have had the opportunity to visit this sacred place (twice and counting!). Watch a tour video of the DomQuartier, the stunning Baroque palace and cathedral complex. For hundreds of years, it was the epicenter of all religious and political power held by Salzburg's ruling Prince-Archbishops. 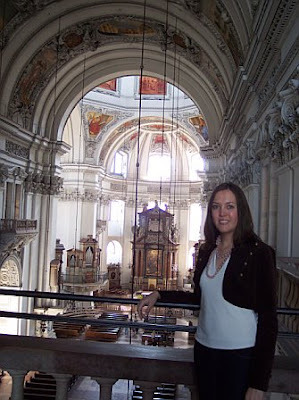 The Salzburg Cathedral was at the center of Mozart family life. As members of the congregation, it was the location of Leopold and Anna Maria Mozart's wedding ceremony as well as the baptism of their children. The original baptismal font is still in a beautiful pristine-like condition given that it dates from 1321. Imagine! It was already 435 years old when the infant Mozart was baptized on January 28, 1756, a day after his birth. Mozart's father Leopold was a composer, teacher and violinist employed by the Prince-Archbishop as Vice-Kapellmeister. Mozart soon joined and worked alongside his father, eventually gaining appointments as Konzertmeister and Court Organist. Some of his duties included composing, instructing the choirboys and performing (organ and violin) at the cathedral as well as at court. Mozart wrote many sacred works for the cathedral including masses, litanies, vespers and church sonatas. Can you imagine attending church services with music composed and performed regularly by Mozart himself? Although it's no substitute, you can listen to live broadcasts from the cathedral on Sundays and holidays which often feature Mozart's music. Watch this short video from Rick Steves featuring Mozart at Sunday morning mass. "The organ loft fills the church with glorious sounds as Mozart, 250 years after his birth, is still powering worship with his musical genius." The "Hoforgel" ("halo organ") was often Mozart's instrument of choice. Photo: Kelsey O'Brien. There are four smaller organs and one grand organ in the cathedral. The south-eastern organ to the left of the alter, known as the "Hoforgel" ("halo organ"), is said to have been the instrument primarily used by Mozart during his tenure. The Hoforgel can be seen from the perspective of the grand organ loft in my photo below. To be able to look up and imagine the virtuoso in action is another invaluable gift from the enduring act of preservation. Sadly, the original dome was destroyed in 1944 during WWII, but was reconstructed by 1959 (see photos). As you can imagine, the acoustics are best in the pews directly under the dome! To say that father and son had a difficult relationship with their employer, Prince-Archbishop Colloredo, would be an understatement. It eventually led to Mozart's break to Vienna in 1781 with Leopold remaining in Salzburg. Although unfulfilled and longing for a career in opera and secular music expanding far beyond the reaches of the myopic Salzburg court, Mozart penned some exquisite music for the cathedral during his time there including the "Coronation" mass KV. 317, Missa solemnis KV. 337, vespers KV. 321 and KV. 339 and the Regina coeli KV. 276. The pinnacle of the music heritage experience is listening to live performances at the venue where the music was originally composed, performed and/or otherwise enveloped in a biographical relationship with the artist. There's no greater sonic aura than when these elements come together. To envisage and hear a work as the artist did in within the same environment forges an unparalleled connectivity between listener and artist. Globetrotting to landmarks aside, listeners can achieve a similar closeness with the music through seeking out recordings from historical venues and videos capturing live performances at those locations. Whether we experience it in person or from afar, how unique and awe-inspiring it is that we have the opportunity today to hear the sacred music that Mozart wrote for Salzburg in the same setting where he worked and performed! Posing for a photo from the grand organ loft overlooking the nave. Photo: Sherry Davis. One of my favorite recordings of Mozart's Salzburg sacred music is by Peter Neumann and the Koelner Kammerchor and Collegium Cartusianum (listen to sample tracks). Watch a performance of the Kyrie from Mozart's Missa brevis (KV. 220) at the Salzburg Cathedral. Written in 1775 or 1776, it was likely performed on Easter in April 1776. Watch a performance of the operatic Laudate Dominum from Mozart's Vesperae solennes de confessore (KV. 339) at Herbert von Karajan's memorial concert (the most recorded conductor of the 20th Century). Written in 1780, this was one of the last pieces Mozart wrote for the cathedral. During my last visit, I wandered through the exhibition, Zwischen Himmel und Erde: Mozarts Geistlische Musik (Between Heaven and Earth: Mozart's Sacred Music). When words escape me, which they often do when asked how I feel about this music, I defer to the exhibition title which applies to the whole of Mozart's oeuvre. With a sweep of the quill, he masterfully balances light and dark, refinement and earthiness, the popular and cerebral. While Mozart's music is wildly joyful with a Utopian sensibility, he always reminds us of our human vulnerabilities. Whether his music reveals autobiographical sentiment or holds a mirror to our own, he keeps us grounded in that sense, but otherwise gives us the grandest of wings through his art.